White Rabbit (WR) Ethernet hardware is an important device for accurate time distribution between detectors. One of the uses of WR is to distribute signals of a reference clock, for example a hydrogen maser (H-maser), a timekeeping device in atomic clocks. 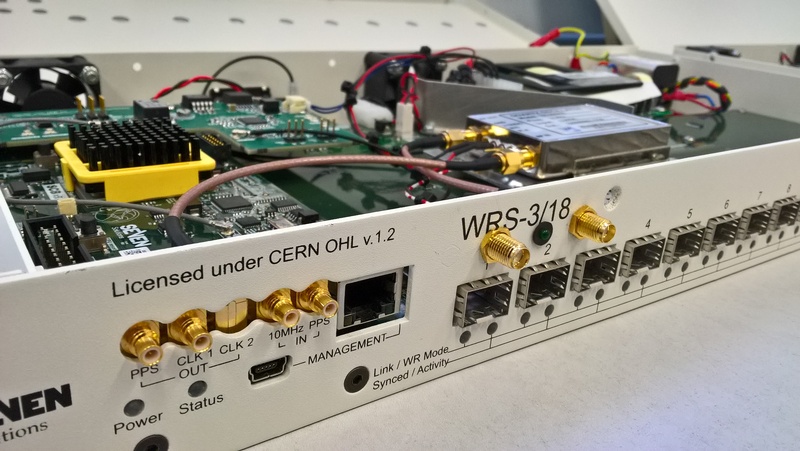 WR makes distribution of time and frequency through length-compensated fiber-optic networks possible and allows for subnanosecond precision in time distribution between detectors. An upgrade to the originally developed WR may allow the transfer of time and frequency of a single H-maser to many clients over a long distance (> 100 km), without a significant degradation of the stability. This is a solution with a substantial lower cost than using multiple H-masers. 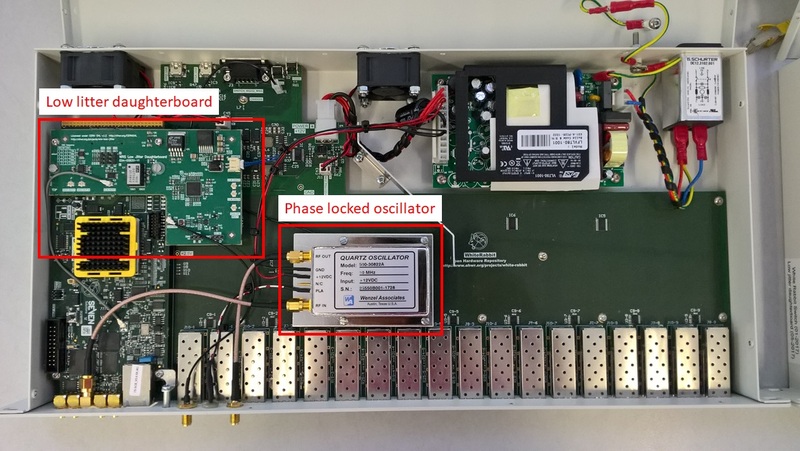 To improve phase noise and stability of radiofrequencies over fiber-optic links, commercially available WR Ethernet switches were upgraded with a low jitter daughterboard and a phase locked oscillator. This was then tested under laboratory conditions. The low jitter daughterboard improved the phase noise and stability of the transferred radiofrequencies. The phase locked oscillator improved the phase noise and short term stability even more, in such a way that the performance of an H-maser may be approached. To give an indication of the improved performance, the frequency stability averages down from 7x10-13 at 1 s to 3x10-16 at 7000 s with an enabled bandwidth of 0.5 Hz. The measured RMS phase jitter (between 1 Hz and 100 kHz) is 0.18 ps for the improved version of the WR equipment, while the RMS phase jitter is 13 ps for the default WR equipment. The upgraded hardware will be used for the H-maser at the Westerbork and Dwingeloo radio telescopes that are used for very-long baseline interferometry (VLBI). White Rabbit Ethernet switch with low jitter daughterboard and phase locked oscillator. Credits: Chantal van Tour and Jeroen Koelemeij. White Rabbit board. Credits: Chantal van Tour and Jeroen Koelemeij.